SAN JOSE, January 4, 2016 – With ISE 2017 quickly approaching, Atlona announces the public debut of the AT-UHD-CLSO-840, a versatile eight-input, four-output 4K HDMI and HDBaseT matrix switcher built for videoconferencing, multi-screen presentations, and divisible room installations. The CLSO-840 offers both local and remote inputs and outputs for flexibility across AV formats and connectivity options, providing a powerful matrix solution for the classroom, corporate, and hospitality environments. The matrix switcher will be demonstrated at Stand 5-S92 from February 7-10 at the RAI Exhibition and Conference Centre in Amsterdam. 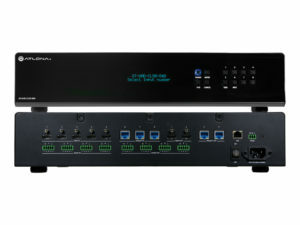 The new matrix is equipped with five HDMI and three HDBaseT inputs, two HDMI outputs, and two HDBaseT outputs. It is envisioned for use in a variety of meeting room settings, such as videoconferencing suites requiring at least three independent outputs for connections to displays and a conferencing codec. The CLSO-840 easily integrates into an audio system with DSP, through an independent 8×4 audio matrix that routes de-embedded HDMI audio to analog audio outputs, with gain control and EQ also available. There are also four analog audio inputs, each dedicated to embedding content onto a corresponding video output. This versatile matrix switcher is immediately available and is competitively priced at $4,999.99 MSRP. It includes Atlona’s award-winning 10-year limited product warranty and customer support services so that integrators can specify, purchase, and install with confidence. Other advanced features on the CLSO-840 include PoE on the HDBaseT inputs and outputs, allowing the use of Atlona UHD-EX Series or HDVS-200 Series HDBaseT transmitters and receivers, and eliminating the need for separate power supplies for remote components. All HDBaseT inputs and outputs allow transmission distances up to 100 meters (330 feet). The new matrix includes Ethernet and RS-232 connections for third-party control. It can extend Ethernet from a control processor and features IP to RS-232 translation for converting TCP/IP commands to RS-232. This provides the flexibility of extending TCP/IP or RS-232 control to remote devices over HDBaseT. System integrators further benefit from the Atlona Management System (AMS), a powerful network software platform ideal for configuring, managing, and monitoring the CLSO-840 and other Atlona IP-controllable devices over a LAN, WAN, or VPN. AMS is available free from Atlona, and greatly streamlines installation and maintenance of several Atlona products throughout a facility or enterprise, from a standard web browser.